A long rest was needed after the ups and downs of the previous day. The weather had cleared up enough for us to feel comfortable braving the Narrows. Even though we would be without the recommended walking stick. We took our sweet time puttering around South Campground in the morning. We realized we underpaid for the first two nights (access passes get 50% discount on campsite fees, not annual passes). We paid for one more night and the difference we owed, again careful to not upset any camping karma. We were nearly immediately rewarded when we noticed a Free Stuff Pile and there on top was a perfectly good, albeit slightly bent, walking stick! After another chat with the helpful Rangers Carolyn and Amanda, we were once more on the shuttle to the Temple of the Sinawava. The Virgin River, and all rivers really, is a very powerful thing. As we rode the shuttle up to the trailhead, the soothing voice over the bus speakers told us about the many times the river had washed out the road causing evacuations and necessitating road repair. Despite the many times this had happened, the voice assured us it would have happened a lot more if not for the work of the men of the Civilian Conservation Corps (the workers were segregated and no women ever enrolled). Back in the 1930s and 40s these government workers came in and did hours of what was certainly physically taxing labor to secure the river banks. This engineering of the river caused it to run straighter, faster, and kept water out of the historic flood plain and, thus, out of the road. 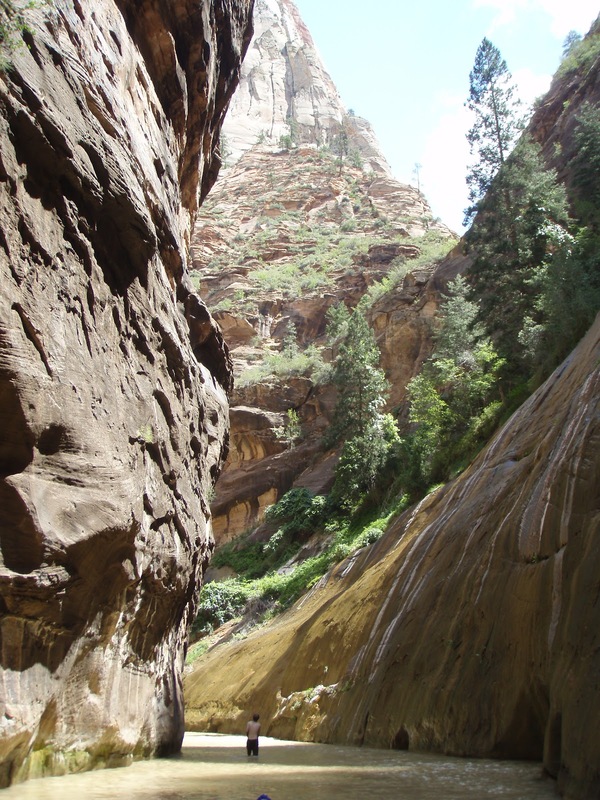 Despite the good intentions of the CCC, all their hard work had unexpected consequences on the riparian ecosystem surrounding the Virgin River. As our drive up to the trail head continued, the voice informed us that most of the cotton wood trees along the riparian strip next to the Virgin River were about the same age, and that is why we saw so many dead trees on the drive. These trees were old. You see, cotton wood trees need areas with near constant water sources to grow. Even the fluffy seeds the trees release each year have to land on damp soil in order to germinate. Due to the flood control measures enacted in the early 20th century, there are very few young cotton wood trees along this area of the river. The shuttle audio didn’t go into detail, it was only a 30 minute drive after all, but this sort of change in riparian vegetation can have major impacts on ecosystems. I’m not trying to bash the CCC. It’s so easy to look at these sorts of situations with our modern eye and pass judgment. 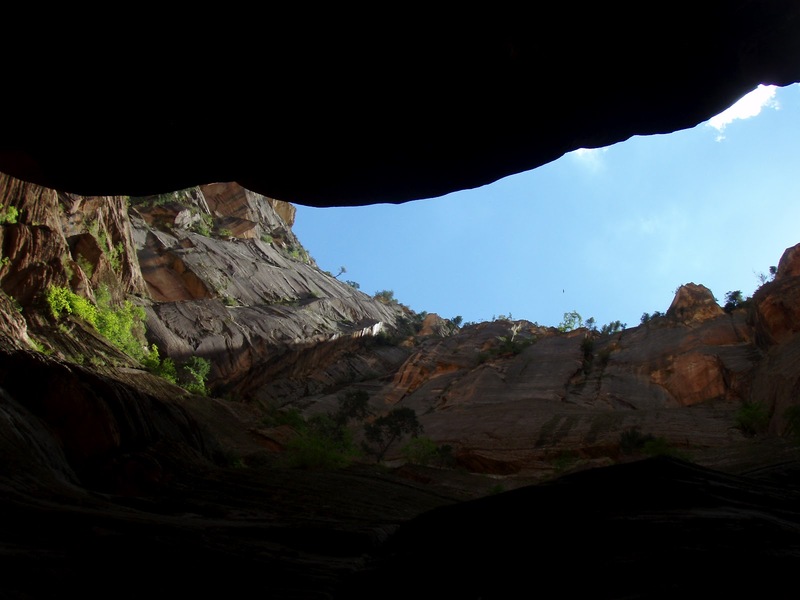 However, I think Zion felt it important to share this story so that visitors could see how fragile these ecosystems really are. Still wide at the beginning of the trail. We arrived. The paved beginning of the Riverside Walk was quite crowded with both hikers and crazy, in your face canyon squirrels. Obviously one or two or a few hundred of the park visitors had disregarded the numerous postings about the importance of not feeding the wildlife. I saw small children walking right up to the rodents while their parents did nothing to protect them. No fear in these little guys. We continued along the river to the entrance. 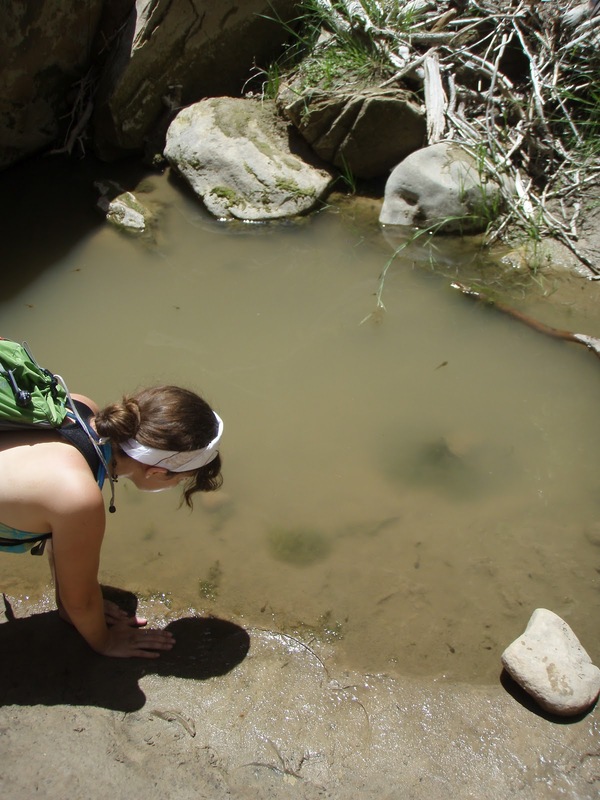 We checked the skies once more before wading into the Virgin River for our adventure. Clear and sunny. No death via flash flood for at least a little while. Heading further up the river, the number of people thinned and the water deepened to our waists. Luckily, we are good little thinker-aheaders and had purchased dry bags before entering the park, so all of our day pack goodies were safe. Rachel, being the stream walking goddess that she is, decided I would benefit more from our karma walking stick. I completely did. Our tiny sliver of sky for cloud watching. The first three miles had periodic banks where we could escape the waters and tricky rocky bottoms for a nice stroll. Then back into the drink. After those initial three miles lay an additional two where we would be hiking in the river the entire time. This was where the danger zone really began. Clouds could roll in at any time upriver and release their torrents and we’d be subject to the results with little time to react. Only a tiny sliver of sky was viable above us, but we kept an eye on it at all times. 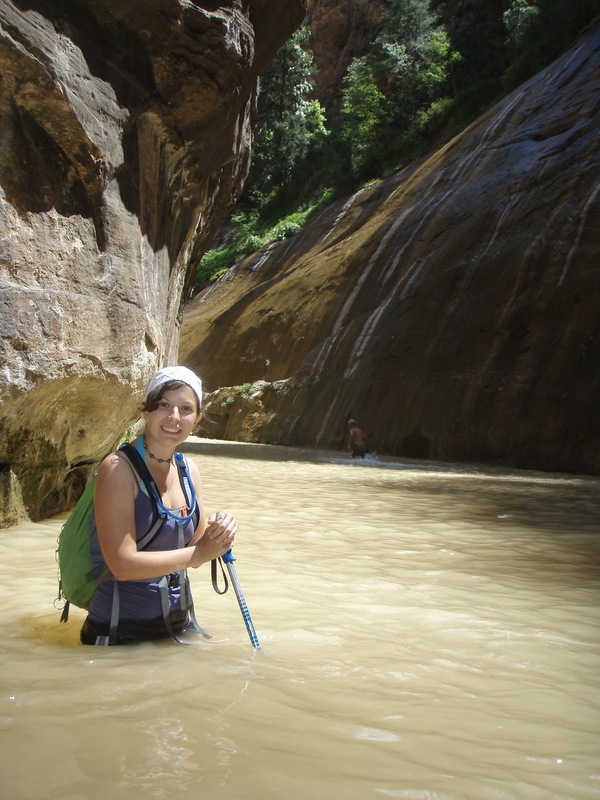 Flash floods are a constant threat to hikers in the Narrows. If you can’t get to high ground, then your best bet it to try and wedge yourself behind rocks or cracks in the wall. Not the deepest we went! We kept on. The water sometimes up to our waists. The rocks sometimes tricking our feet into thinking they were stable. Jerks. Even though I had the walking stick, I still took a few tumbles into the water while Rachel gracefully (well, more so than me) crossed back and forth over the river. I have to admit. The entire time we were hiking past the safe(er) zone I was looking for the best places to wedge myself (and Rachel) in case of a flash flood. It was much too lovely of a day to die in a furious barrage of water and tree detritus. Even with the fear of death, the walk proved to be a worthy endeavor. 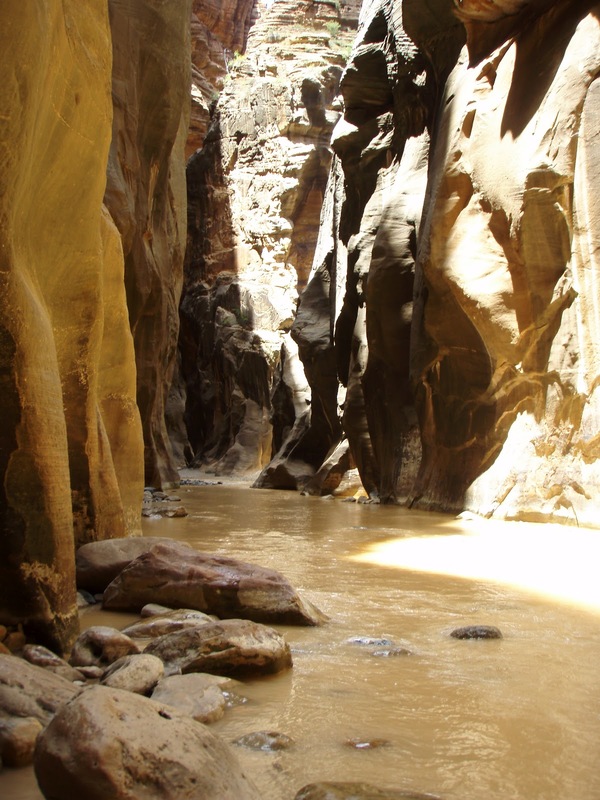 The sunlight tickled in every so often illuminating the impressive sandstone walls surrounding us. We hugged the walls every so often and were in awe of the colors, curves, and hidden treasures they offered. Some sections were shockingly smooth to the touch. We happened across pools teeming with aquatic wildlife that kept us enthralled for quite some time. Tadpoles darted about trying to eat up all the algal yummies so they could grow up to be big and strong with legs and everything. Rachel urged me further and further with the blatant lie of ‘let’s just check out what’s around the next bend’. There was even some veiled taunting, even it she may not admit it. I did want to go that far. Dang it. Our little bit of sunshine in the Narrows. We kept on like brave explorers until we reached an area that we were informed would reach to nearly our chinny chin chins. We looked at each other an a glimmer of understanding passed between us. We were brave, strong, adventurous women. We could handle anything. And thus, we turned and headed back to the trail head. Even adventurous women need to know when to call it a day. It ended up being a very solid decision, as we felt the first few drops of rain as we neared the area with the embankments. Once higher ground was within our reach, we both admittedly felt a surge of relief. There wasn’t a flash flood that day, but we were happy that we would’ve been safe had it been otherwise. We emerged from the water once more victorious in our hike. The masses of people returned, as did the canyon squirrels. They would benefit from exhibiting the same amount of caution and fear as we had on our journey. Have you even gone through with something, even though you were afraid? How did it turn out? Love the vessel name! We'll have to try this next time we're in Zion. We've definitely been signing Just Around the Riverbend too many times.